Biotechnology is not something new. Since prehistoric times, humans have exploited microorganisms for their own use. By trial and error, they have developed the production of alcoholic beverages and food without knowing that microbes were the responsible agent. With the discovery of the existence of microorganisms, and the subsequent development of culture methods, came the birth of modern biological technology or in short, biotechnology (Steele et al., 1991). The term biotechnology has a very broad meaning. It could mean genetic manipulation of mammalian, plant or microbial cells to the use of microorganisms to aid a process. One of the aspects of biotechnology is biotransformation. Biotransformation could be defined as the use of biocatalyst to convert a raw material into a value-added product. The choice of biocatalyst is between isolated enzymes or microbial whole cells. In cases where the biotransformation is a one-step reaction and non-cofactor requiring enzyme is available, then an isolated enzyme often immobilized onto a support is generally the most efficient biocatalyst. An excellent example is the use of lipases for ester synthesis (Eigtved et al., 1988; Lazar et al., 1986 & Staal, 1991). In other instances where the biotransformation is a relatively complex multistep reaction, especially when these enzymatic steps require cofactors, then the only possible approach is to employ a living biocatalyst, usually genetically modified microbial cells (Casey and Macrae, 1992). One of the main advantages of biotransformations is their well-known enantioselectivity. Although chemical reactions with optically active catalysts or auxiliaries could be used successfully, enzymatic reactions are often more economical (KiesZich, 1992). Cheap raw materials such as glucose, complex carbohydrates like starch, molasses or even waste waters are among the favourite substrates for biotransformation (Buhler and Wandrey, 1992). However a number of interesting novel value-added products can also be derived from oils and fats. These products may find new industrial applications. Development of branched alkylbenzene sulfonate (BAS) The replacement of soap with surfactants achieved importance during World War II when oils and fats were in short supply and their replacement became technically and economically feasible (Swisher, 1987). BAS, a synthetic surfactant derived from petrochemical, was the most widely used surfactant during 1950s and early 1960s because of its excellent detergent properties, its low cost and attractive physical properties of its formulation (Hashim et al., 1989). BAS manifests several advantageous characteristics such as good cleaning ability, good solubility and good foaming power. After a few years, the changeover was complete and BAS became the major surfactant used, first in the U.S. and later around the world. BAS contains a highly branched carbon backbone linked to a sulfonated benzene ring. 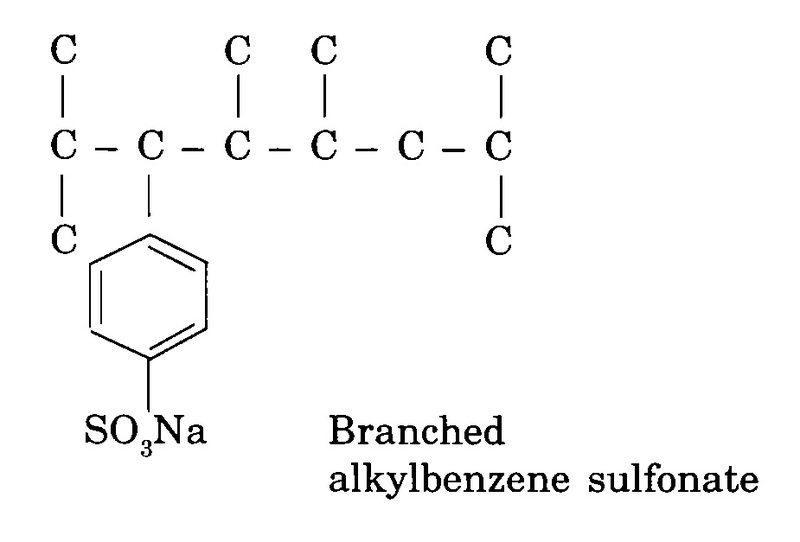 Alkylbenzene sulfonate is attacked by microorganisms through the alkyl chain, not through the sulfonate group or the benzene ring (Nielsen et al., 1985). In the case of BAS, the alkyl chain is resistant to microbial attack due to the highiy branch hydrocarbon chains. Microorganisms are deficient of enzyme systems that can attack and biodegrade such highly branched alkyl chains when they are attached to a benzene ring, thus posing problems in the biodegradation of BAS. BAS began to be noticeable in waste waters, treated sewage and receiving waters because they retained their foaming properties in natural waters at concentrations around 1 ppm (Swisher, 1987). However, certain bacteria are able to degrade BAS up to 60% during the primary and secondary treatment processes. However this degradation is slow and consequently, measureable amounts (ppm) are present in treatment plant effluents and these normally enter water systems. In other words, BAS does not undergo complete biodegradation and persists in the environment. Surface-active substances or surfactants are molecules having amphiphilic characteristics, i.e. both hydrophilic and hydrophobic properties (Hutchinson et al., 1967; Van Dyke et al., 1991). Because of the presence of hydrophilic and hydrophobic groups within the same molecule, surfactants partition preferentially at the interface between fluid phases of different degrees of polarity and hydrogen bonding. The formation of an ordered molecular film at the interface lowers the interfacial tension and is responsible for the unique properties of surfactant molecules (Georgiou lat al., 1992). The hydrophilic part of a surfactant may be anionic, cationic or neutral, while the hydrophobic portion normally consists of hydrocarbon chains. Depending on the type of charge present, there are four possible kinds of surfactants, i.e. anionic (negatively charged), cationic (positively charged), nonionic (no charge) and amphoteric (positive and negative charges within the same molecule) (Georgiou et al., 1992).